Swain was always a super obnoxious lane bully top lane. When you add in Grasp of the Undying to the mix, he suddenly becomes incredibly annoying and scales super hard into late game. Most melee champions will have a huge issue making any damage stick to this guy. Picking up Grasp of the Undying on Swain allows him to abuse melee champions much harder as he essentially gets free stacks every time the rune is up. This amplifies his otherwise already obnoxious ranged vs melee bullying power. Swain's early game sustain is mediocre compared to later on. However, but picking up Grasp of the Undying gives Swain the ability to play similar to Vlad. This is especially good since it doesn't cost mana to use this version of sustain. As a late game champion, Swain's main draw is how tanky he is after his core Rod of Ages. 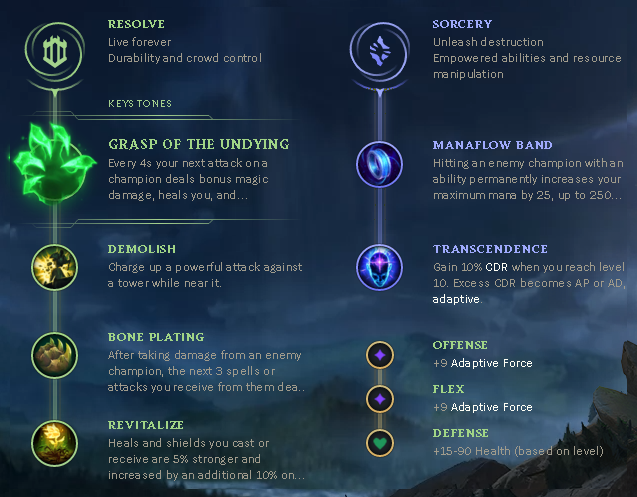 Grasp of the Undying further accentuates this and gives Swain a surprisingly high amount of HP considering he can use it on every cooldown against melee champions. The main rune Swain players use is Phase Rush. 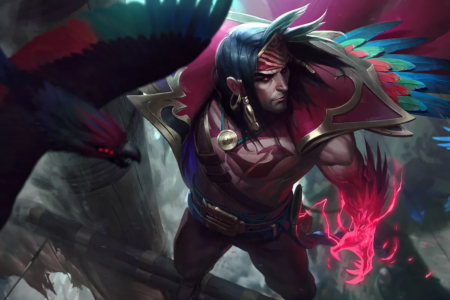 Phase Rush provides Swain better chase potential and the ability to run away if necessary. By swapping to Grasp, Swain trades some of his late game offensive power for early game sustain and mid to late game durability. Grasp of the Undying Swain is good if you're up against a melee top laner. If you're fighting a ranged champion Phase Rush may still be better in order to run them down.